- Supports to load audio files to split or merge in Windows Explorer directly: right-click the files (including *.cue, *. pls, *.m3u ), and select to open with MP3 Splitter & Joiner Pro in 'open with' menu. - MP3 Splitter Pro: Improve the split by silence feature, it is able to detect the silence length even in 10ms (minimum silence length). - Improve the compatibility of generated audio file: some of split or merged audio files can not be successfully loaded by Windows Media Player. - MP3 Joiner Pro: automatically free the source audio file while setting the output ID3 tag. Supports to split and merge MP3, WMA, WAV, APE, FLAC, OGG audio files. Be able to merge and split audio files of extreme large size over 4GB. With 'Batch Split' feature, you can split multiple audio files easily by just a simple click. Be able to automatically detect the silence in the audio to split (Split by Silence), and you can easily to split a large single audio file to the separate segments/songs. With 'Partial Merge', you can merge any portions of audio files directly by just a simple click without export the portion in advance. Download FREE trial - It is free and easy. Get started to split or merge your MP3 WAV files by just a few simple clicks! MP3 Splitter Pro supports to split MP3, MPA, WAV, WMA/ASF, OGG, Monkey's Audio(APE), FLAC audio files and MP3 Joiner Pro supports to merge MP3, MPA, WAV, WMA/ASF, OGG, Monkey's Audio(APE), FLAC, AIFF audio files. MP3 Splitter & Joiner Pro is able to join and split extreme large audio files over 4GB. Split multiple audio files in a single split session by just a simple click. You can quickly and easily set split parameters to all audio files in a split group, such as switch split mode, split special, save list, edit ID3 tag, etc. MP3 Splitter & Joiner Pro is able to automatically detect the silence in the audio to split. It is quite useful to split a large single audio file to separate segments/songs by detecting the silence between the segments. MP3 Splitter & Joiner Pro will analysis the audio file you just loaded in 'Auto. Detect' Mode and then automatically select the best merge mode for you. 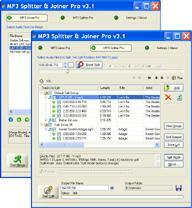 MP3 Splitter & Joiner Pro is able to merge either the entire file or any portions of a file by just a simple click. With this feature, you can merge any portions of audio files directly by just a simple click without export the portion in advance. MP3 Splitter & Joiner is able to import track information directly from either M3U (*.m3u) or PLS (*.pls) file, as well as export track information back to a M3U (*.m3u) file. In addition, you can use this feature to save your current work at any time. MP3 Splitter & Joiner Pro is able to directly merge audio files in different audio formats or in different encoding parameters.